About a month ago, on my way back from holiday, I stopped over in London and naturally went over to my favourite bean bazaar or specialist coffee roaster – HR Higgins, Duke Street, London and stocked up on more coffee. 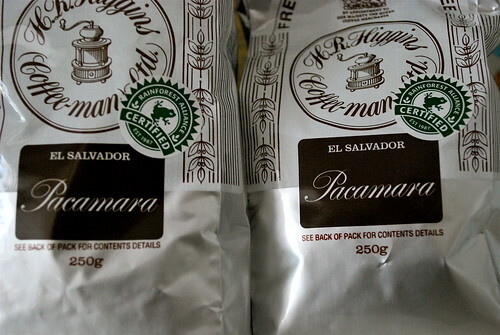 I was lucky enough to be offered one of their new beans, El Salvador Pacamara. Trusting the salesman on this occasion, I took two 250g bags, as they do two types of roasts, medium dark, which I usually find goes well with milk-based espresso drinks and very dark roasted, which is lovely for espresso (shhh ! don’t share the secret). On return to Vienna, I was pleasantly surprised by the versatility of the 2 roasts. Sure enough, my predictions matched my expectation in that the medium-to-dark version was lovely as a cappuccino and the very dark version was nice as an espresso, but more importantly for my coffee grinder, I didn’t really have to fiddle about with the grind switch for both types of coffee. Am I making sense ? If not, I’m going to have to get a little bit tekky (technical) here. In short, I’ve discovered that you cannot use the same grind setting for a medium dark roast and a very dark roast coffee to get the ideal espresso shot (i.e 23-27 seconds depending on what book you read). The secret is…… well ! perhaps not a secret for pros, is that you need a finer setting for very dark roasts. So for example, if you usually grind your coffee on say dial 7 for a medium dark coffee, with dial 1 being the finest (like powder and usually for Turkish style coffee) and dial 10 or above being like clumps (usually for French Press), then when you come to grind a dark roast coffee, you need to use a shorter dial, like 6 or 5 to get the same grind. 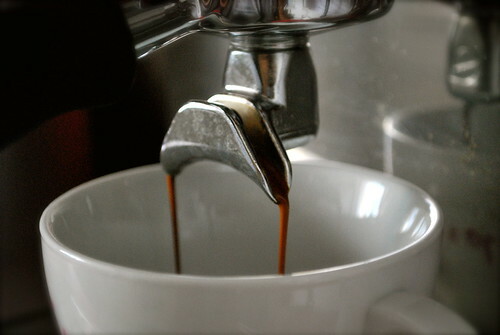 For me, on my previous coffee grinder, it was easy, but my new coffee grinder is a bit of a pain as there are no dial settings – you just turn the knob, after wasting about 30 grammes of coffee until you get the right grind, but I’ll save more of that headache for another post God willing. Anyway back to El Salvador Pacamara. 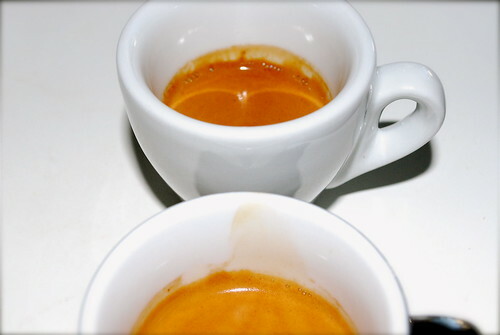 For espresso, I found it light and sweetish. I could taste the sweetness at the tip of my tongue – perhaps my palate is getting more sophisticated to all the speciality roasted Arabica coffee I keep throwing down my mouth 3 times a day. Excuse the pic below – I was still playing with my new digital SLR camera and the flash was a bit too bright. The richness of the colour can be seen in the pic above during extraction. Naturally, I kept the medium-to-dark roasted coffee for my morning fixes of cappuccinos and the sweetish taste contrasted well with the smooth silky sweetish frothed milk that accompanied it. Excuse my latte art, still trying to get there…. In summary, I thought that the bean was well rounded and very versatile, easily adaptable for both types of espresso drinks (with and without milk). The taste is not over powering and “bold” and reminds me of the typical Central American coffee (just in case you were wondering where El Salvador is, it is in Central America). It is not as acidic as the champions of Central America – Costa Rica and Guatemala, but still worth a buy and I’m sure your non-coffee mad friends will find it pleasant to drink too. So get out there and try some coffee from El Salvador. 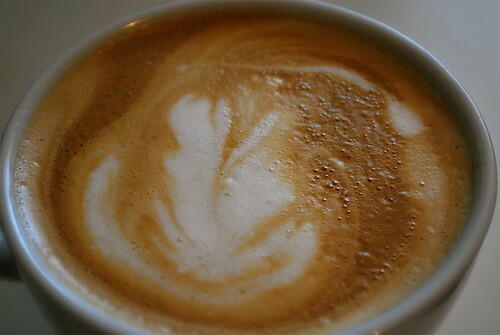 This entry was posted on Monday, October 6th, 2008 at 1:06 pm	and posted in Bean Talk - Coffees, I'm Drinking. You can follow any responses to this entry through the RSS 2.0 feed.